Over the years, the sports supplement industry has spent billions of dollars developing protein powders, energy bars, and gels that purport to help your body recover after strenuous workouts. But according to scientific research, it turns out that burgers and fries do just as good of a job at helping athletic performance. Are the effects of supplements, then, pure b.s.? Unconvinced by glitzy marketing campaigns run by the supplement industry, University of Montana graduate student Michael Cramer set up an experiment that would pit protein powders and bars against McDonald’s pancakes, hash browns, fries, and burgers, reports Real Clear Science. Cramer had eleven top-tier male athletes undergo a 90-minute endurance workout after fasting for 12 hours. Following their workout, one group was assigned fast food, the other supplements. Two hours later, each group was told to eat again, and wait another 120 minutes before riding 20 kilometers on a stationary bike as fast as they could. A week later, the experiment was repeated, but this time the groups switched. Upon analysis, Cramer found that athletes completed the time trial just as quickly after eating fast food compared to supplements. 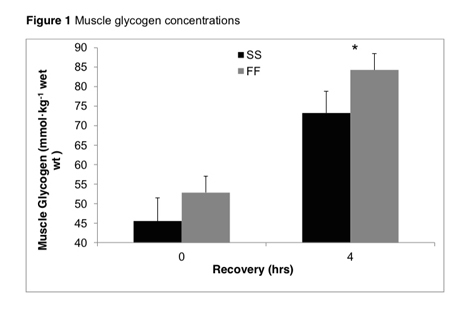 Moreover, levels of muscle glycogen were actually higher for the fast food (FF) group than for the supplement (SS) group. Think of glycogen as your muscles’ fuel; when it’s depleted, exercise performance suffers. Furthermore, Cramer found no difference in insulin, glucose, cholesterol, or triglyceride levels. Subjects reported equal amounts of stomach discomfort. Granted this is only one study, yet it does raise issues about the so-called “benefits” of high-performance supplements, and whether that premium you’re paying is really worth it. Fast food is still calories, of course, but you would have been better off eating a banana and some granola. Until Lebron or Kobe endorses post-game burgers, we remain skeptical.